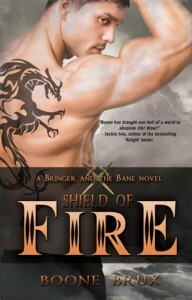 Demons, hidden magical talents, and an incredibly handsome man willing to shield you from danger. Not too bad of a deal, Ravyn manages to make the best of it at any rate. Ravyn’s story begins with her fleeing her home, which also happens to be an abbey run by a very corrupt man. So you think it is a good idea to run. Until she is outside the abbey walls and a demon tries to fly off with her. And then you are introduced to Rhys and the story is instantly more attractive.... um, interesting. Rhys and Ravyn are rare and special people, and now that they have found each other the feel that they are meant to be together. Sort of what people the world over are looking for, that special someone you click with. Of course most people will not be depending on the others talents to battle demons. Brux has created an interesting world and makes you feel connected to not only Ravyn and Rhys but also the secondary characters and even some demons. You know how it goes; you love to hate the bad guys. The pace of the book seems a little slow at times but the end is well written and sets up for book two nicely.